I found another website that deserves your attention. 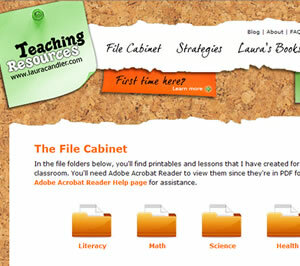 It’s produced by a 28 year veteran teacher, Laura Candler, and has well-organized and extensive resources. She has produced 13 books for sale but has also offered 100’s of blackline masters for free. Yes, she likes to share and the quality of these freebies is head-and-shoulders above many paid offerings. Do you teach Math, Science, Health, Language Arts, Social Studies, Literary Lessons, Holidays, Accelerated Reading, Cooperative Learning, Center Activities and other odds ‘n ends? Then you need to familiarize yourself with the deep well that is Laura Candler’s website. This link will take you directly to her “file cabinet,” which contains the bulk of the free materials. I have no doubt that you’ll check out the rest of her site while you’re there. I’ve always tried to shine a light on websites that have really good (free or awfully close to it) teaching resources . Lately I’ve hit a rut and haven’t spotted anything worth mentioning. I’m asking you, my readers, to drop me an e-mail about sites you really like so that I can share the information with the thousands of fellow teachers that visit this site. Thanks in advance for any hot tips!